Into our modern era the job of color in painting was to articulate the visible world, which it did anew with eye-opening freshness and authority in the hands of the Impressionists, only to have their successors advance the case that color could be shorn of its descriptive function and employed expressively, to embody feelings not otherwise visible. Thus liberated, emphatic personalized color provided, during the past century, the engine that drove the Brucke and Blaue Reiter expressionists in Germany, the Fauves in France, and, following World War II, the Post Painterly Abstractionists of the New York School. What the latter gave us—what Rothko and Still and Newman and Hofmann, Frankenthaler and Louis, Noland and Olitski and Stella, gave to the art of our time—were pictures as visually arresting and emotionally moving as any produced by moderns and modernists alike since the middle of the 19th Century. Postmodern sensibilities that germinated in the 1970s haven’t generally endorsed the value judgments guiding that synopsis of color picture history. Disillusioned by the failed promises of the previous decade—a reaction quickly transferred to 20th Century modernism generally—they’ve opted more for cultural deconstruction and critique, for irony, and for detached, anti-aesthetic interest than for quality and conviction. From such a position, the tradition extending from Matisse to Stella, say, is seen less as a pictorial achievement than a decorative art historical sidebar, an assessment echoing a concern that was initially voiced decades before, most notably by Marcel Duchamp, who, in the face of the Fauves and Cubists, declared the new art mere visual pleasure—in a word, retinal. As a corrective, he called for art to restore ideas to itself, the implication being that it would otherwise devolve to comprise objects lacking meaningful content, objects, that is, which were indistinguishable from ordinary things in the world, things that could only nominally be considered art, like bottle racks or bicycle wheels, for instance, instead of the real McCoy, like the things in museums. And so was born conceptual art—art that equates content with ideas. Conceptualism’s critique notwithstanding, the colorist equation of content with feeling continued to figure prominently—as it had figured prominently since the late 1940s—across our visual culture’s increasingly pluralistic stage during the later 1960s and the 1970s. Which is when the three painters presented here—Ronnie Landfield, Sandi Slone, and Darryl Hughto—were coming into their early maturity. Each was fully schooled in modernism, and each absorbed from the start the ways and means of Post Painterly Abstraction, in particular its primary emphasis on a personal and expressive use of color, but also its techniques of paint application, staining and pouring among them, methods of getting paint from the can or tube and onto the canvas that minimized paint’s physicality on the one hand and indulged it on the other, but in either case suppressed the gestural handling of it in order to allow color its maximum impact. Each has now been painting for more than four decades, and each has in the process periodically made ambitiously large pictures, as well as pictures that are frankly and unapologetically beautiful, candid in celebrating color as a vehicle of emotional content, intuitively smart in structuring its deployment to assure the content’s credibility. Regularly inspired by their modernist past, yet at the same time unburdened by it, each has also looked periodically to nature, not in opposition to abstraction, which was the charge presented against painting nature in the 1950s, but as a resource for enriching it. My inspiration has been my conviction that modern painting is fueled by the combination of tradition and the realities of modern life. Spirituality and feeling are the basic subjects of my work. 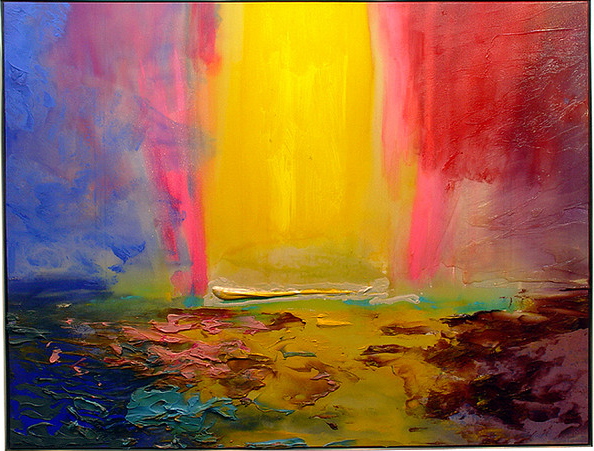 They are depictions of intuitive expressions using color as language and the landscape…as a metaphor for the arena of life. The revelation of a primal image that delivers an immediate response in the viewer is my goal. The recent works do not describe nature. They attempt to imitate the processes of nature in the way they are made, relying on the fluidity of chance and rigorous control that is rooted in exploring the unexpected and the unknown. My absolute favorite motif is the imaginary landscape, usually just consisting of a horizon, sky above and land or sea below, maybe a blob or two on the horizon reading as islands or clouds. With this format I am the most free with color and paint handling. 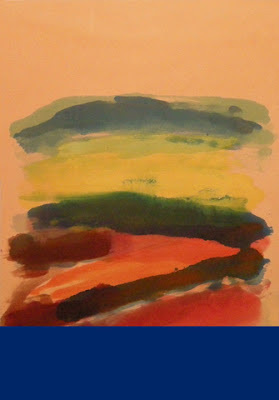 It puts more pressure on the color, and the simplicity of the drawing allows the viewer to relax and just feel it. I can have my cake, as I had it when I was totally geometric and painting diamonds, and eat it too, great savory hunks of paint swimming in buckets of puddles and pours. Ronnie Landfield’s signature paintings generally comprise stained fields of light-breathing color bordered by a single color geometric band along the lower framing edge and sometimes one or two additional bands rising along the sides of the picture. 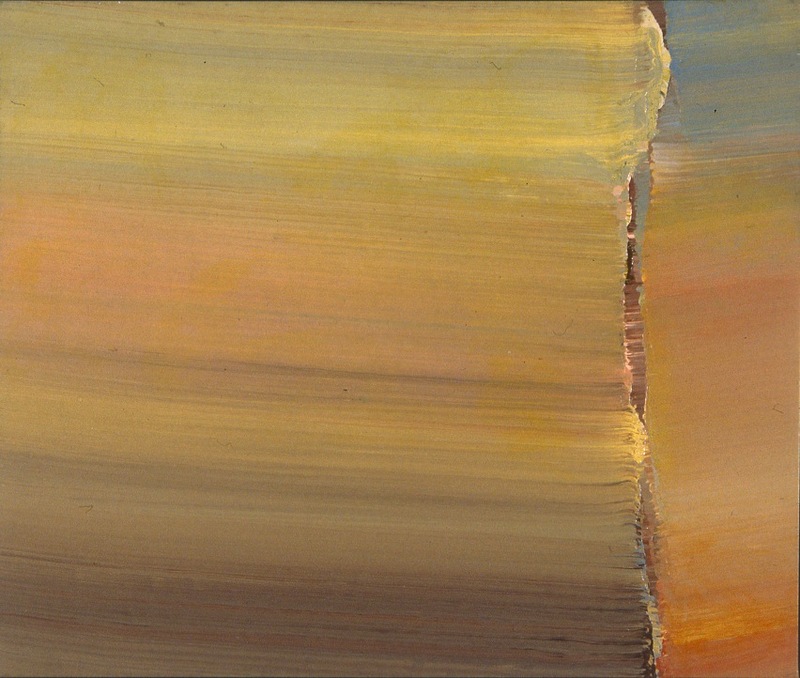 The bands represent a formal element he first employed in minimalist paintings of the 1960s in response to Donald Judd’s quarrel with painting’s inherent spatiality and part-by-part relationships—his claim being that painting was flawed by illusion, that it wasn’t its literal self—so Ronnie Landfield added the bands as a way of reminding us of painting’s flatness. All of which probably sounds kind of academic, even a little preposterous from the distance of nearly half a century, but such were the issues informing critical discourse at the time—they were immediate, they felt genuinely urgent, and they occasionally found their way into the studio, just as their counterparts do today. 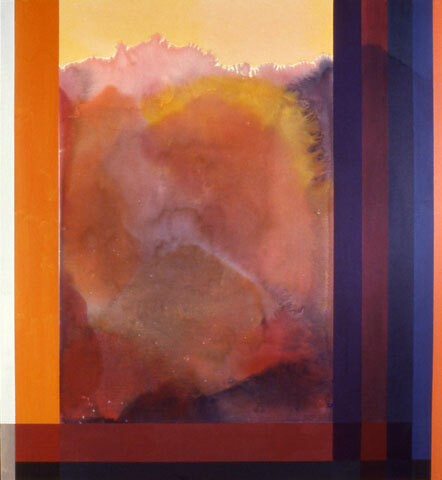 Ronnie Landfield, For John Keats, 1978, acrylic on canvas, 81 x 93 inches. 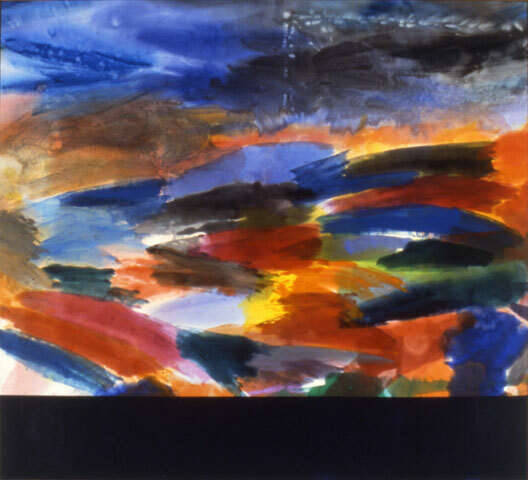 Ronnie Landfield, Joseph’s Coat, 1986, acrylic on canvas, 88 x 81 inches. But you don’t have to know all about that discourse when you look at the pictures themselves, you just have to know that what the bands might have meant in the past isn’t necessarily what they might mean now. I, for one, find the bands highly effective. They lend structure to the paintings but without suppressing them, without imposing their will upon the range and spontaneity of feeling that’s lyrically articulated within them or the exhilarating release we experience in looking at them. 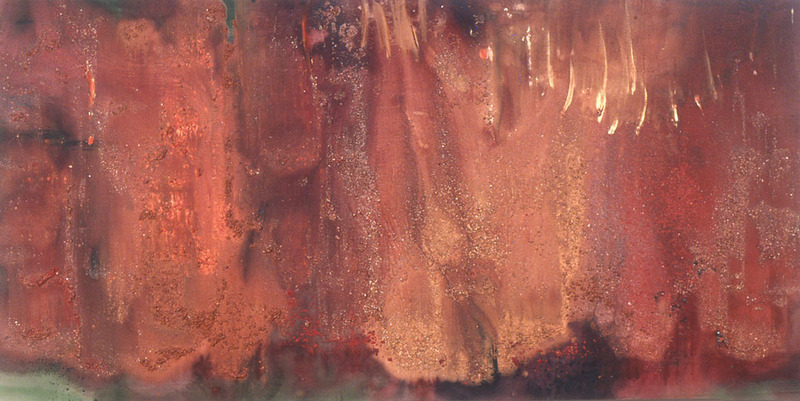 Concomitantly, the freedom that is expressed and celebrated within the paintings, and that is identified with our response to them, is acknowledged as existing within limitations—which is how freedom invariably exists in lived experience, for it would otherwise be not a reality, but a hollow concept. The bands’ meaning in these paintings thereby becomes timeless. Ronnie Landfield, The Deluge, 1998, acrylic on canvas, 108 x 120 inches. 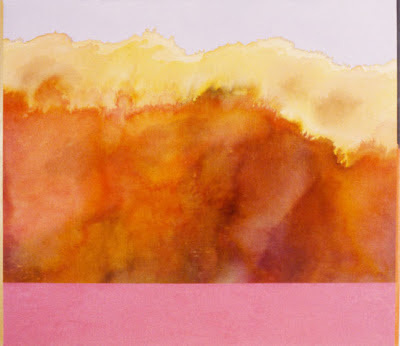 Ronnie Landfield, On the Threshold, 2008, 44 x 29.5 inches. Ronnie Landfield, Blue Wall, 2010, 44.5 x 53 inches. Sandi Slone is clearly sensitive to the bonding of freedom and limitation in citing her reliance on the “fluidity of chance” in tandem with “rigorous control”. What I especially appreciate in the statement about her current working procedure, at the same time, is the urge whereby chance and control enable her pictures to “imitate nature in the way they are made”. The urge is certainly evident in her recent pictures, which appear as phenomena that have come into being entirely on their own, like celestial or aquatic torrents, brilliantly illuminated from within, that sweep through space without human agency or intervention, without being shaped or composed, as if obeying rules of their own—like natural forces. 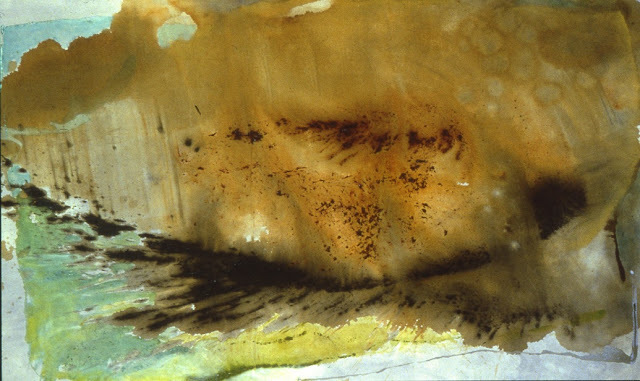 Sandi Slone, Tiger Eye, 1976, oil and acrylic on canvas, 69 x 80 inches. 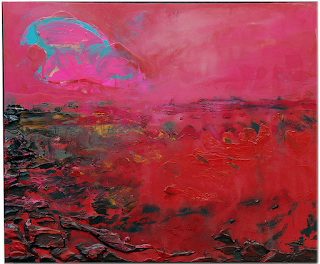 Sandi Slone, Rasputin, 1984, oil and acrylic on canvas, 84 x 120 inches. Sandi Slone, Fire Wave, 1990, oil, acrylic and sand on canvas, 60 x 126 inches. 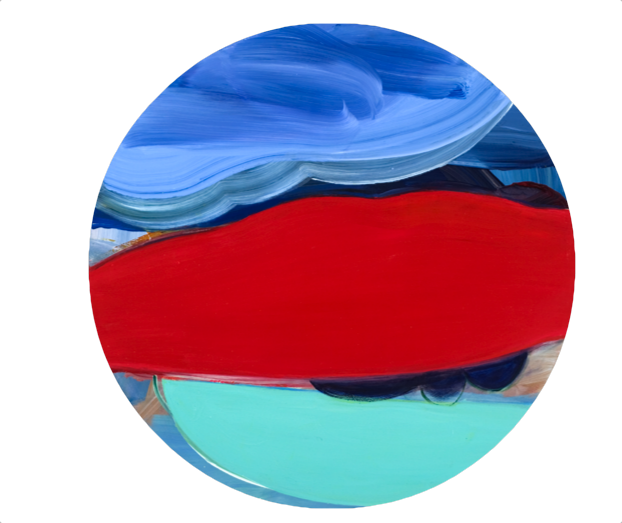 Sandi Slone, Sky, Field, Lips, 2009, oil and acrylic on canvas, 36 inches diameter . 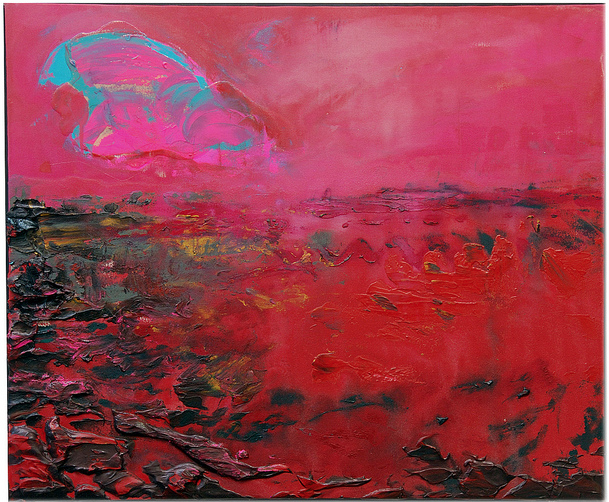 Sandi Slone, Vast, 2011, oil and acrylic on canvas, 18 x 14 inches. 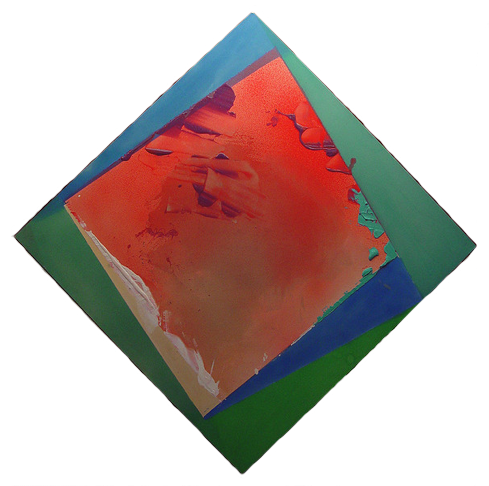 Darrly Hughto’s painting format in the 1970s comprised diamonds within rectangles or squares, sometimes centered and aligned with one another, sometimes askew. It sustained an effective run of pictures through the decade, but the work then slackened, whereupon he tried working en plein air, he cast about and wrestled with himself, and, by the later 1980s, he emerged as a landscape/still life/figure painter. He wasn’t alone in radically shifting gears during a career in full stride. David Park and Philip Guston had both famously done so out of dissatisfaction with abstraction and the urge for a more outwardly focused kind of pictorial content. But Darryl Hughto wasn’t after a new kind of content. Darryl Hughto, Saint Gingerbread, 1978, acrylic on canvas, 78 inches diagonal. He harbored no argument with modernist abstraction, far from it, but neither was he out to demonstrate the kind of virtuosic, many-voiced performance—already a postmodernist trope at the time—whereby a solo show of new work looked for all intents and purposes like a group exhibition. 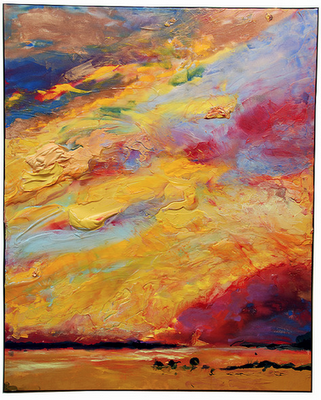 Rather, what I think he was looking for was a new format, one that would anchor and extend anew his reach into the color-as-feeling territory he’d been inspired to explore all along. Which he found in landscape more than anywhere else, as his own words clearly acknowledge, and as the chromatic splendor and emotional exuberance of his pictures surely attest. He’s referenced both German Expressionism and the French Fauves in connection with his newer pictures, bringing to mind Kandinsky and Matisse. 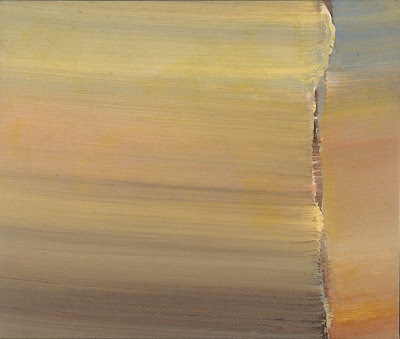 I’d personally add Nicholas de Stael, from the 1950s School of Paris, whose luscious physical color reminds me of Darryl Hughto’s sensuous “hunks of paint.” As you probably know, French painting back in the 50s was regarded as the kind of painting our Abstract Expressionists didn’t want to make. It was too French, too arty. Today, however, the deep satisfactions of Darryl Hughto’s paintings enable us to see in the present the pictorial exuberance that was being overlooked in the past. Good art can do that, it can make you rewrite art’s history. 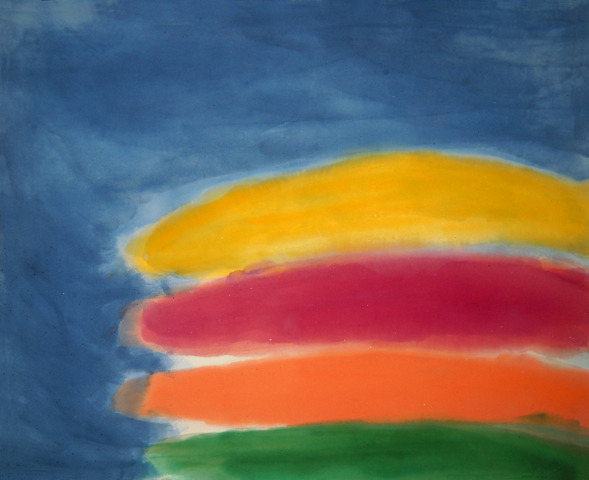 Darryl Hughto, Pillar Point, 2005, acrylic on canvas, 52.5 x 68.5 inches. 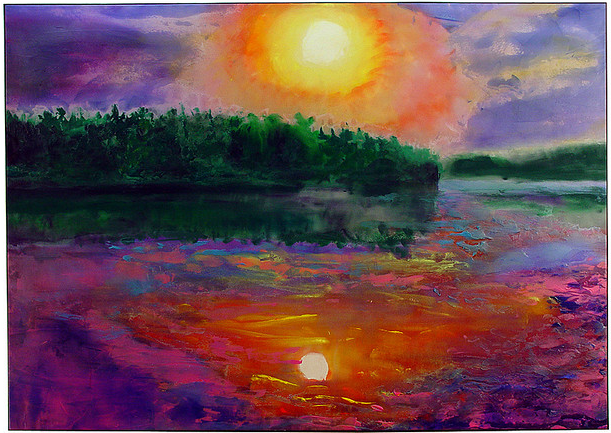 Darryl Hughto, Great Spruce Head Island Sunrise, 2009, acrylic on canvas, 57 x 47 inches. 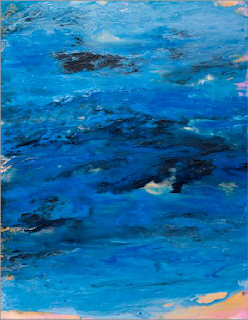 Darryl Hughto, Cherry Island, 2010, acrylic on canvas, 29 x 36 inches. Wonderful statement and commentary about three terrific painters, the state of art of our time, and Art in general. Carrying the torch. Thank you so much for this edifying post; I printed it and posted it in my studio as a guide to help me stay on my true course through these so-called "edgy" and "ironic" times. I thought I posted a comment here when this first appeared but it looks like it didn't go through. I loved this post and have sent it to so many of my friends as well as writing about it on my own blog, Slow Muse. Carl is so well positioned to speak up for this excellent work. Well done, well done. I thought I left a comment but it is not showing up so I'll try again. I loved this post so much, and I too, like others, sent the link around to many of my artist friends. I also posted about it on my own blog, Slow Muse. Carl highlights work that can be, given the current trends and proclivities, overlooked or unappreciated. It is a point of view that needs to be promulgated, and Carl is so well equipped to articulate this position. Thank you for this. I'm sorry you had trouble commenting -- I've gotten similar complaints. We've been getting more than the usual amount of spam comments lately, I wonder if there may be a connection. I'll report it to Google Blogger. I like Slow Muse very much. Thanks for your support. I thought I left a comment but it is not showing up so I'll try again. I loved this post so much, and I too, like others, sent the link around to many of my artist friends. I also posted about it on my own blog, Slow Muse. I don't have my interview with Sandi yet. But I do have interviews with Ronnie and Darryl. It's amazing that Carl chose to write about three fantastic painters that I too am putting in my own documentary. Thanks to all at the Left Bank Art Blog for being one of the most educational blogs for art on the net.